Now that we have reviewed the detailed comparison between Spotify and Apple Music, Spotify and Deezer, Spotify and Tidal, today we will make a further comparison between Apple Music and Amazon Music from various aspect: price, library features, audio quality, exclusives, so that you can choose the right one. To know how Apple Music compares to Amazon Music, you can see the breakdown for rough overview. 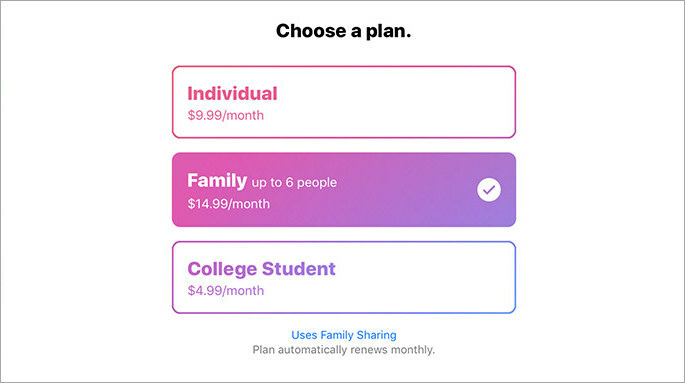 Apple Music offers 3 tiers: $9.99 per month for individual, $4.99 per month for student, and $14.99 per month for up to 6 family members. This is a standard price among the music streaming area, and it is acceptable compared with spending money on purchasing albums or singles from iTunes. If you still hesitate to choose your subscription among various services, you might try Apple Music 3-month free trial to fully enjoy all features of Apple Music. If you are not down with it, you can cancel the free trial at any time without wasting a penny. If you want to sign up Amazon Music (Amazon Music Unlimited in this article), it costs $9.99 per month for individual, $14.99 per month for family package (share with up to 6 family members), and $4.99 per month for eligible students. If you are Prime member, you will need to pay $7.99 per month to sign up for Amazon Music Unlimited standard tier. The big difference between Amazon Music and Apple Music is that you just need to pay $3.99 per month for use on one Echo device (Echo Show, Echo Look, Echo Dot, Echo Spot, Echo Plus, or Amazon Tap) powered by Amazon's own Alexa AI assistant. But if you want to use Amazon Music more than one Echo or other devices, you will need to pay $9.99 per month ($7.99 per month for Prime member). 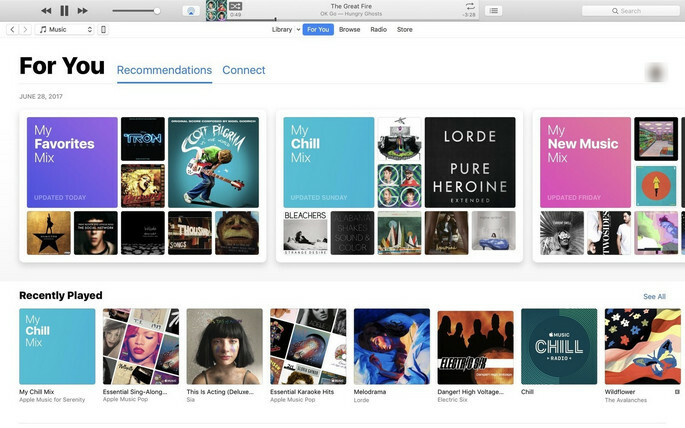 The Apple Music interface looks different compared to its rivals: simple layout of the main features. The tabs along the above (bottom on the mobile app) offer pretty straightforward navigation: Library, For You, Browser and Radio. For You is a selection of curated playlists, albums, artists tailored to your taste and the music/album you recently played. Though the desktop app often crashes, but the mobile app is more smoothly. 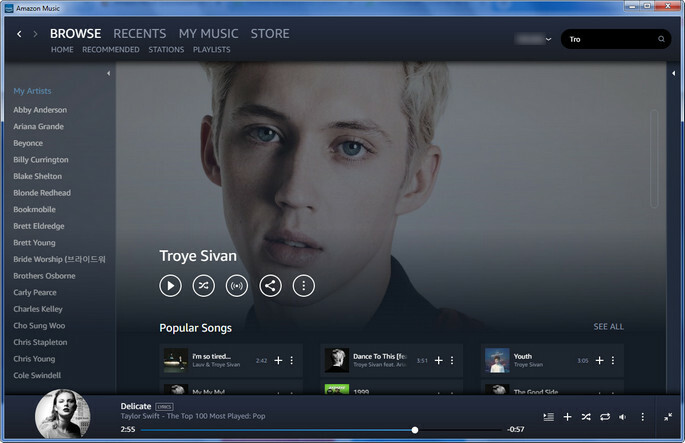 The user interface looks a little bit similar to the main music streaming services in the market. The navy blue-glazed interface looks very intuitive, clean and orderly than Spotify and Apple Music, but a litle bit painfully slow and clunky. It’s split into four main sections: Browse, Recents, My Music and Store (the mobile app swaps this for an Alexa), and four sub-sections beneath: Home, Recommended, Stations, and Playlists. You can minimize or open the right panel to hide or show your created playlist. The search bar, in which can specifically search across your music library, Unlimited service and store. I love the artist page: after you locate your favorite artist, you will see a big and beautiful image in the top, then his popular songs, albums, related playlists or artist below. And if you scroll down the mouse, you will see the full image. Actually, the Amazon Music UI is more attractive at the first look, but I prefer Apple Music, the lily-white background makes the contents more conspicuous and easy to find what I want, especially the beautiful interface for specific artist and album. Music catalogue is another important feature for a music streaming service. Apple Music has over 40 million licensed tracks and is good at curation: you will be asked to select your favorite genres, and artists, then you will get the recommendations tailed to your tastes, playlist or album whatever. Sometime, you also can find some exclusives on particular albums. My own personal feeling: the Euro and American artist and albums are reasonably complete, but lacking of the localized contents in some countries. Amazon Music has over 45 million licensed tracks and dozens of stations, and the home page will directs you to find new releases, popular and recommended music, playlist, or album, which is similar to Apple Music. Actually, you will find that both Apple Music and Amazon Music have approximately the same offers: featured artist like Taylor Swift, Drake, and more. Personally, I do not like the playlists on Apple Music, though it is organized and varied every day, I think it is worse than Amazon Music or Spotify. Amazon Music Unlimited gives you the option to purchase the song or albums from its Digital Store and lists all genres of music including relaxing, party, Indie rock, workout, country, classic, pop, R&B music in the bottom of browse section. Apple Music and Amazon Music have the same catalogue in which you will find most of the tracks from big labels or record, but the exclusive may differ. Apple has taken steps to secure more exclusives to increase subscriber numbers, including the albums of Drake, Taylor Swift, Frank Ocean, and etc. And Garth Brooks, the most popular and famous country singer in America, was a big exclusive for Amazon Music Unlimited. If you have no idea about which one you should pay for, you can think about your main tastes. If you are massive fan of Drake or Taylor Swift, Apple Music is your right choice. 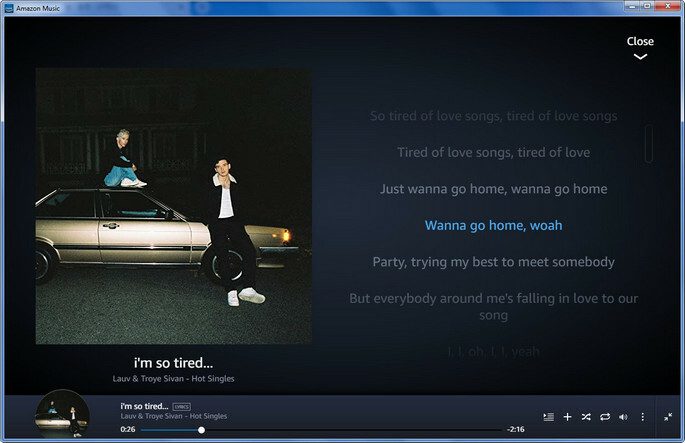 Lyrics: Amazon Music has the best uses of lyrics in the streaming music services. Instead of offering a static page like Apple Music (you will need to tap on the music you are listening to, then tap on three-dots icon and select "Lyrics" to view the lyrics). Amazon Music has scrolling music that moves in time with the lyrical performance. I am really impressed with this cool feature. Device Compatibility: Amazon is more easy-going to cooperate with other companies' platforms, while Apple has its own eco-system. Apple Music works on iPhone, iPad and Mac, later on Android phones or tablets. It also works on Apple Watch, HomePod, in CarPlay-compatible vehicles, or Sonos speakers. 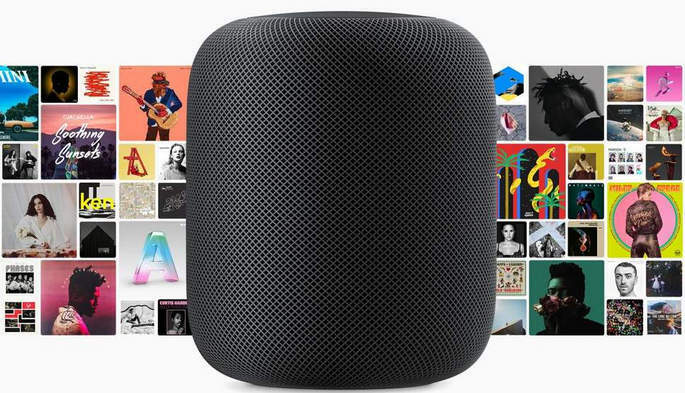 But Apple Music will not officially work with Amazon's various Alexa-powered smart speakers, such as the Echo or Dot, though you can stream it on iPhone via Bluetooth, but lacks of the voice control. Amazon Music works on nearly all smart phones, tablets and smart speakers in the market. What's more, if you have Amazon's Alexa-powered smart speakers, like Echo, Amazon Music undoubtedly the best option. Amazon Echo, Echo Dot, and Amazon Tap owners only pay just $3.99 per month to subscribe Amazon Music Unlimited. If you want to stream on multiple smart speakers, you need to pay the regular $7.99 per month fee. Voice Control: Voice commands have become quite common in our daily life. 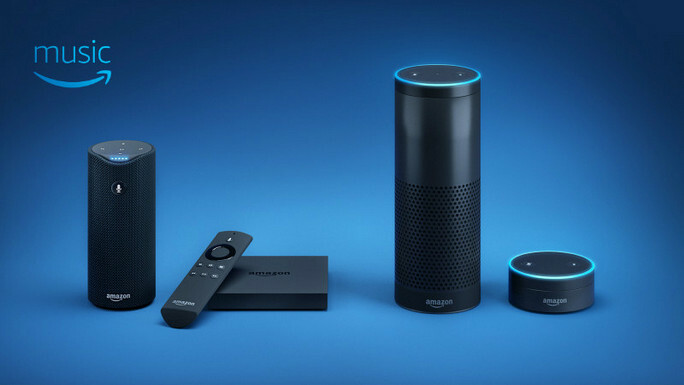 Now, Amazon applies Alexa vioce control to its Music app. 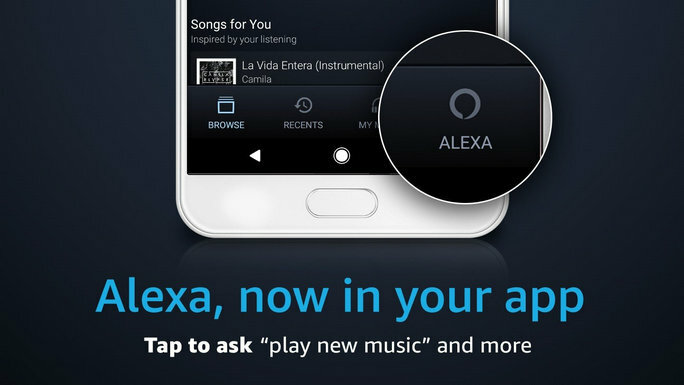 That means you can command Alexa to do things like play or pause music, move back and forth between songs, and create playlists by asking, as well as take advantage of Alexa’s more innovative features around playing music by mood, activity, genre, lyrics, artist or song title. As for Apple Music, you can also ask Siri to play, skip, shuffle or dismiss specific tracks. 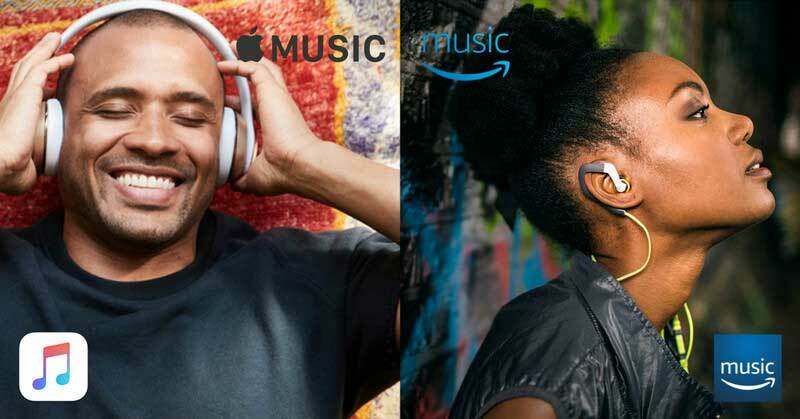 Bottom Line: Apple Music or Amazon Music? You might be quickly attracted by Amazon Music Unlimited's varied pricing scheme, library, and Amazon Echo compatibility. Though Amazon Music doesn't change the game fundamentally in this domain, but it does offer standout features as good as Apple Music or Spotify, especially if you have one of Amazon's Alexa-powered smart speakers. Apple Music is a good streaming service with a different approach to curation than Spotify. And i like the way that Apple Music organzes its songs, albums, artists and playlist. If you are a big Apple fan who have a bunch of Apple devices already, particularly the HomePod or Apple Watch, subscribing to Apple Music will make life easier. Extra Tips: How to Save Apple Music to Computer Forever? Although we can freely enjoy our favorite music after subscribed to Apple Music, once the subscription expired, the downloads for offline listening will no longer exist. Now, there is still a way to save your favorite Apple Music songs forever on computer. 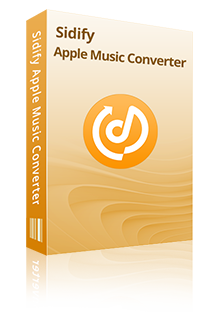 Here we will share you a way on how to remove DRM protection from Apple Music songs and save them on your computer with Sidify Apple Music Converter. Convert Apple Music/iTunes M4P to MP3/AAC/FLAC/WAV. Preserve the quality of the original sound; Keep all ID3 Tags. Highly compatible with the latest Mac/ Windows OS and iTunes. Fast conversion speed & batch conversion & clean user interface.